The holidays often elicit memories of Christmases and New Year’s gone by, and of the family and friends who shared those joyful days. Let us venture beyond our own past for a moment and imagine a New Year’s Day at the Tredwell home on Fourth Street in the mid-19th century; for no doubt this New York family was celebrating what was considered to be the most important and festive day of the entire year. “New York without New Year’s would be like Rome without Christmas.” So wrote Matthew Hale Smith in his Sunshine and Shadow in New York (1879) of the unique custom of paying social calls on New Year’s Day. 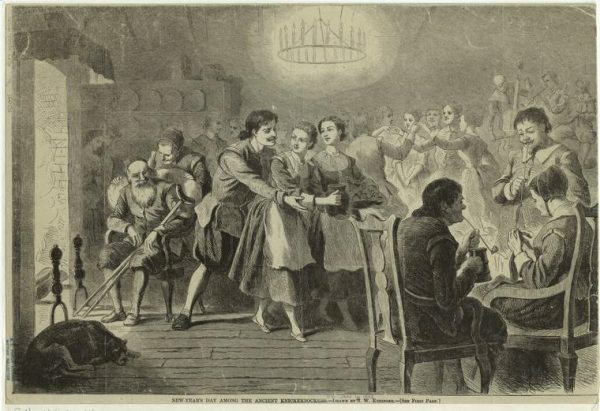 Dating to the arrival of the Dutch in New Amsterdam, this “day of social atonement,” served to redeem social sinners who had neglected family ties and friendships; visiting all the households within one’s circle was a way of renewing and strengthening old bonds. While the ladies remained at home to receive guests (indeed, no genteel woman would be seen on the streets on New Year’s Day), gentlemen ventured to the homes of esteemed women of their acquaintance, to pay their respects and offer good wishes for the New Year. “New Year’s Day Among the Ancient Knickerbockers,” Digital Collections, NYPL. 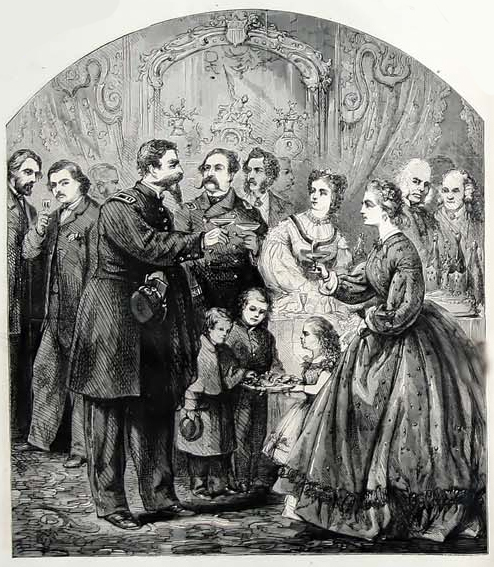 To provide a dose of the generous hospitality for which New Yorkers were known, and to be ready for the onslaught of guests that would arrive on New Year’s Day, the entire Tredwell household was thrown into a frenzy of costly and elaborate preparations for several weeks in advance. The four servants were charged with cleaning the house from top to bottom; families sometimes went so far as to purchase new furniture, carpets, and curtains for the occasion. As the matron of the house, Mrs. Tredwell oversaw the preparations of her New Year’s Day buffet; it must be elegant and luxurious, set with her finest china and silver, and ample enough to feed at least 100 callers. No doubt all the Tredwell women, as well as their four servants, rolled up their sleeves for the marathon baking, roasting, and brewing that was required. The lavish menu might include boned turkey; chicken salad; sandwiches; jellied tongue; pickled oysters; iced plum cakes and pound cakes; and macaroons, Dutch crullers, and other sweetmeats. The spread invariably included alcohol: wine, Madeira, or a festive whiskey punch. One popular brew, “Perfect Love,” was a whiskey, honey, and water concoction the origins of which can be traced back to early 17th century New England. “New Year’s Day.” Thomas Nast. 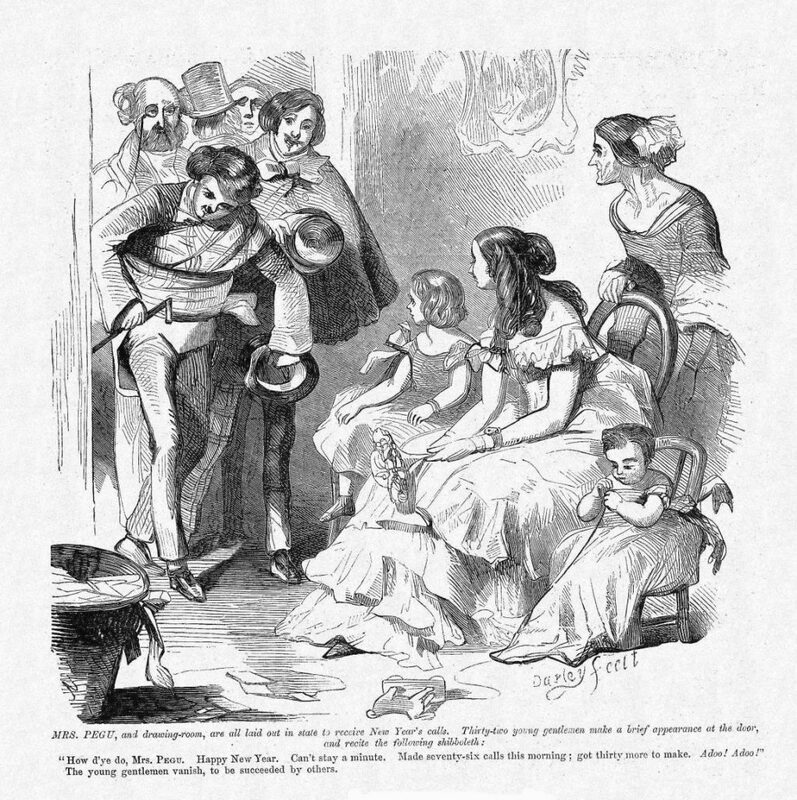 Harpers Weekly, January 2, 1864. Holiday Dresses. 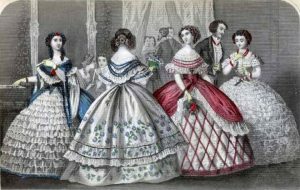 Godey’s Lady’s Book, December, 1859. Mrs. Tredwell running up and down stairs supervising it all! F.O.C. Darley. Mrs. Pegu, 1859. www.harpweek.com. 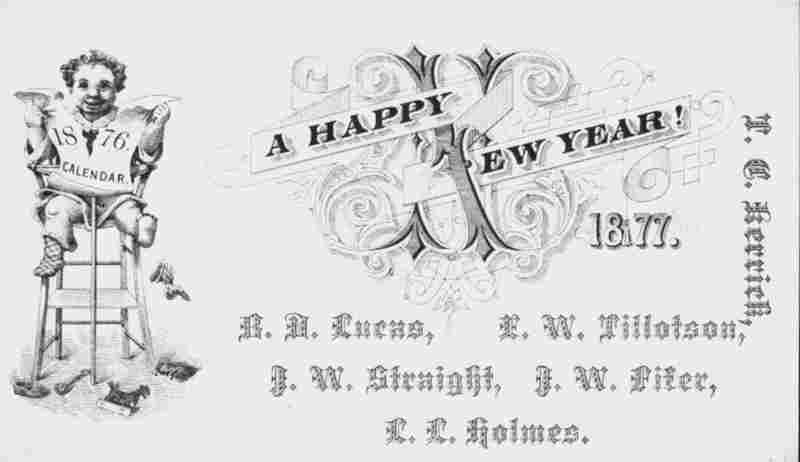 Gentlemen’s New Year’s Calling Card, 1877. www.npr.org. By the 1880s, many women chose to retreat behind closed doors and instead placed baskets on their door knobs for the gentlemen’s cards. New Year’s Day Dinner Menu, Hotel Marlborough (New York City), 1894. 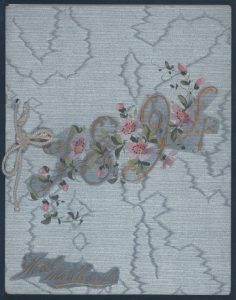 Digital Collections, NYPL. Evelina Nack’s Autograph Album, 1852-53, New-York Historical Society. “So it is gone! another year! 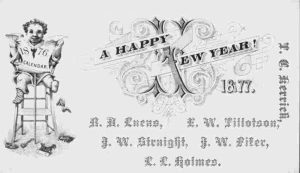 At the Merchant’s House Museum, we continue the 19th century tradition of renewing, reviving, and reaffirming friendships on New Year’s Day. Please join us on Monday, January 1, from 2 to 5 p.m. for tours of the house, 19th century readings about New Year’s Day celebrations, and punch and confectionery. Alcott, Louisa May. Rose in Bloom. 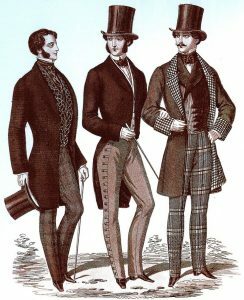 Boston: Roberts Brothers, 1876. An American Gentleman. True Politeness. A Handbook of Etiquette for Gentlemen. New York: Leavitt and Allen, 1848. NYHS BJ 1855. T9. Fawcett, Edgar. “New Year’s Day in Old New York.” Lippincott Monthly Magazine, Volume 55, 1894, p. 138. babel.hathitrust.org. accessed 12/5/17. Knapp, Mary. An Old Merchant’s House. Life at Home in New York City, 1835-65. New York: Girandole Books, 2012. Morrell Family Papers, Box 1. Manuscripts Division. New-York Historical Society. Nack, Evelina. 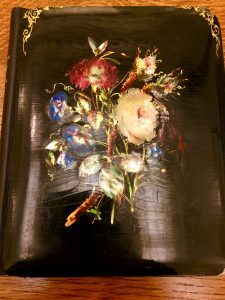 BV Autograph Album. Manuscripts Division. New-York Historical Society 1852-53. Nevins, Allan and Milton Halsey Thomas, eds. The Diary Of George Templeton Strong. New York: The Macmillan Company, 1988. The Evening Post, 27 Dec 1815, Wed, Page 2. newspapers.com, accessed 11/29/17. The Evening Post, 22 Dec 1838, Sat, Page 2. newspapers.com, accessed 11/29/17. The Long Island Star, 08 Jan 1835, Thu, Page 2. newspapers.com, accessed 11/29/17. New York Daily Herald, 2 Jan 1867, Wed, Page 6. newspapers.com. accessed 12/5/17. New York Tribune, 26 Dec, 1843, Tues, Page 1. newspapers.com. accessed 11/29/17. 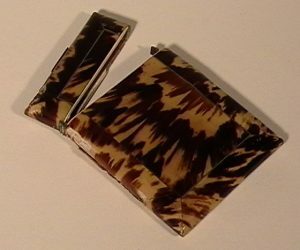 Pintard Papers, Box 7, Folder 8. Manuscripts Division. New-York Historical Society. Smith, Matthew Hale. Sunshine and Shadow in New York. Hartford, CT: J.B. Burr and Co., 1879. internetarchive.org. accessed 12/5/17. Stoddard, Richard Henry. New Year’s Day Half a Century Ago. New York: Bacheller, Johnson & Bacheller. New-York Historical Society. Pamph GT 4905.S76 1896. Tuckermam, Bayard. The Diary Of Philip Hone, 1828-1851, Volume 1and 2. New York: Dodd, Mead and Company, 1889. Wharton, Edith. “New Year’s Day,” in Old New York. New York: D. Appleton and Co., 1924. Yates, Donald. “Beginning Tavern History,” Bottles and Extras, May-June, 2007, p. 38. www.fohbc.org. accessed 12/4/17.